Connect with nature, joy, and community at The Good Move retreat, a weeklong dance, yoga, pilates, and surf retreat on the Costa Rican seaside. Jules Bakshi brings body-positive dance and Pilates classes and mindful eating workshops, and Emily Giovine guides creative, alignment-based Vinyasa and Restorative yoga classes, and centering daily meditations. In addition to movement classes and special workshops, there will be plenty of time to surf, hike, paddle board, ride horses to the Nayucaca Waterfalls, or lounge and restore. They cannot wait to move with you! 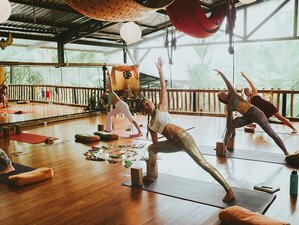 Nestled in the verdant and resplendent natural beauty of Costa Rica’s southern Pacific coast, Danyasa Yoga Retreat and Eco Lodge is your home for retreats, classes, and teacher trainings in yoga and other movement arts, as well as a hub for surfing, adventure, exploration, and relaxation. Imagine yourself sitting beneath a majestic waterfall, zip-lining through the rainforest canopy, diving under the warm waves, and practicing yoga in their beautiful Bamboo Yoga Play studio. Jules Bakshi is a professional dancer and choreographer, Pilates instructor, and integrative nutrition health coach practicing and creating in Brooklyn. She teaches body-positive dance and Pilates classes and mindful eating workshops. Emily Giovine is a New York City-based dancer and yoga teacher. She teaches creative Vinyasa classes with attention to alignment, subtlety, and breath. Class is rigorous, yet accessible, and designed to integrate and educate the body as well as create physical, mental, and emotional space. During meditation practice, Emily offers simple, powerful tools to connect with the breath and steady the mind. Sessions are led in a straightforward and encouraging manner, allowing for mindful acceptance of the present moment. Dominical, Costa Rica, is considered one of the most bio-diverse areas in the world, where beautiful, healthy food, jungle adventures, and a blissful beach community await. Please book your flight to arrive at Juan Santamaria International Airport (SJO). Transfer from and to the airport is included. The Good Move will pick you up from the airport. Passionate about empowering people through movement, mindfulness, and community.